Applications have closed for this year! Please check the email that you included in your application for a decision. The mission of the Youth Arts Journalism Initiative (YAJI) is to use The Arts Paper to train 9th-12th grade students from New Haven Public Schools (NHPS) to independently research, report, draft, and publish articles about hyperlocal visual, performing, and culinary arts. 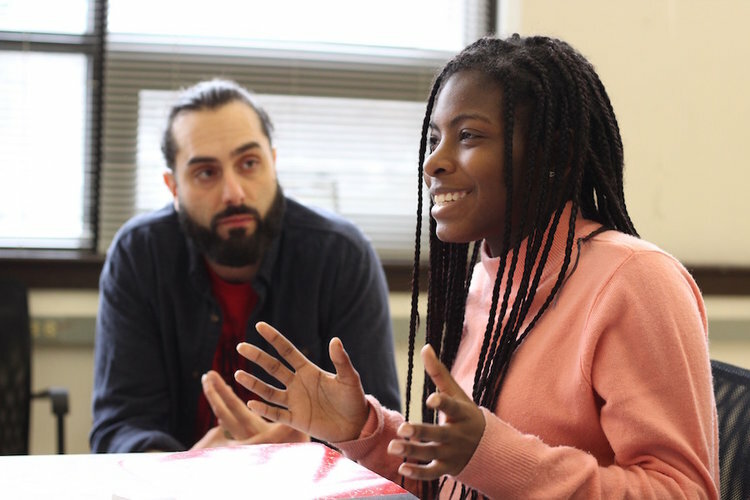 The next semester starts this April with a weeklong intensive during NHPS spring break and then seven weeks of pitch meetings and professional mentorship after school at New Haven Public Library's downtown Ives Branch through June. Students are compensated $250 for their participation and work, in what we hope will be a path to creative economic empowerment. Become an individual member of the Arts Council for the latest upcoming YAJI opportunities! May have an interest in the arts, creative writing, and/or journalism, as well as a math or science concentration. Weeklong Intensive: Monday-Friday, April 15-19, 10 a.m.-3 p.m.
Weekly Pitch Meetings: Tuesdays from April 23 - June 4, 2:30-4:30 p.m.
YAJI is aligned to satisfy the National Core Arts Standards, which have been adopted by the Connecticut State Board of Education. Last year, we noticed that creative writing was getting the boot in some schools across the country and the state, and that didn't sit well with us. We wanted to draw a connection between the creative work many students do, and the critical skills it prepares them for as young journalists. YAJI zeroes in on critical analysis and engagement, ability to put artistic ideas in cultural context, and creation of original content. Our interpretation of an "article" is broad: students are allowed to produce comic strips, original music, video, or podcasts as their final capstone projects, if they are accompanied by a written summary. Want to know more? You can our sample curriculum here.